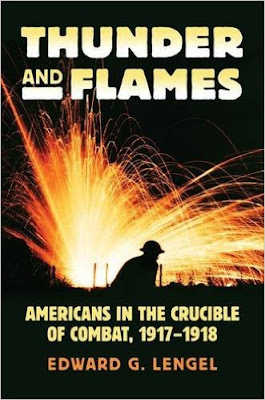 Veteran journalist and author Joseph C. Goulden offers a good review in the Washington Times of Edward G. Lengel's Thunder and Flames: Americans in the Crucible of Combat, 1917-1918. In a decision that history declares was perceptively wise, President Woodrow Wilson kept the United States out of World War I until a string of outrageously dumb decisions by Germany — notably unrestricted submarine warfare — left him little choice but to enter the hostilities. Pershing wanted to build a force strong enough to “push the enemy out of the trenches and force the fighting into the open,” and to do so with maximum use of artillery barrages and head-on assaults. Edward Lengel's book is valuable because he draws heavily upon German and French military records as well as those of the U.S. Army. And he concludes that much of what earlier historians have written about key events does not hold up.